Information exchange is available via the harness system attached to the forehead. The harnesses are made of special conductive silicone, which allows for very low-current electrical communication through the computer’s USB port and a multi-functional interface box. The basic principle of the mode of action of the L.I.F.E. System device is the following: The L.I.F.E. System device sends a square wave signal with amplitude of 5 volts, and a duty cycle of 50% to the harness. The frequency to be applied, for determination of our test, is about 47.3 kHz. The measurement current throughout the body is limited to a maximum of 10mA, but usually no more than 5mA or less. During the testing/assessment phase a client’s biofeedback response is measured in response to nearly 7,000 separate items in 39 separate categories. This process takes approximately 4 to 7 minutes depending upon the speed of the computer. 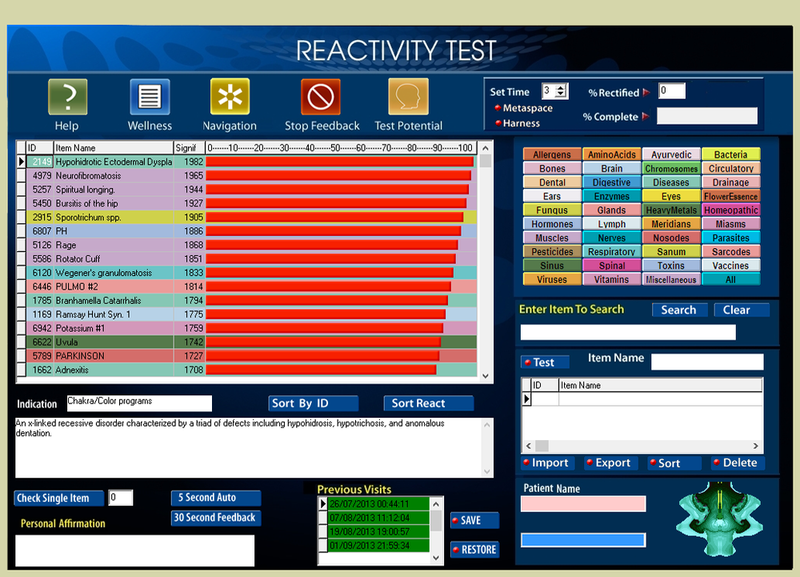 The computer calculates an average value of response between 0 and 2000, which results in a list defining the individual’s reactions or stress potentials. The greatest energy disturbances will be recorded and displayed at the top of the list. Each substance has its own distinctive, complex waveform, which is graphically viewed and represented by a unique fractal image. Additionally, the test matrix contains a detailed description of each substance. The results obtained by the L.I.F.E. System device can only give hints to physical states in which the presence of a particular imbalance is likely. The final diagnosis must be confirmed by other methodologies such as X-ray or MRI in any case. For further information please visit the LIFE System's head office - New York. Raymond Massie - Business Consultant.